If you are searching for an advanced action camera then GoPro Hero5 will be the best choice for you. This device has been manufactured with all amazing features and is much improved as compared to Hero4 Black and Hero4 Silver. If you already have GoPro Hero4 Silver and now are little confused about whether to invest on GoPro Hero5 Black or not then the article below will be highly beneficial for you. There is no doubt to say that manufacturers have worked hard to launch Hero5 Black as it contains all those features that action camera lovers were demanding from a long time. 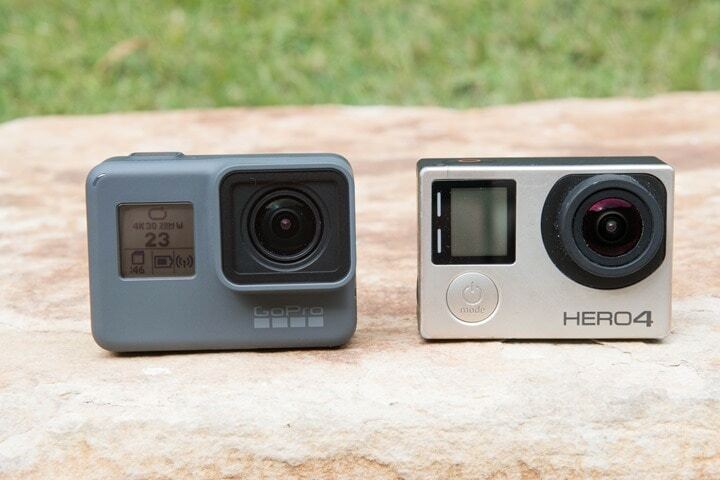 It is right time to go for a detailed comparison between Hero5 Black and Hero4 Silver so that you can easily make up your mind about whether to invest on new one or not. The GoPro Hero5 Black is designed with an appealing look, its slim construction with little taller and wider design make it really very attractive. If you have installed the battery and memory card then maximum weight of Hero5 Black will go up to 4.2 Oz or 118 grams whereas on the other side the Hero4 Silver possess overall weight of 2.9 Oz or 82 grams without additional housing and it can go up to 5.1 Oz or a45 grams with standard housing arrangement. The best thing to know is that these new designs never demand any additional housing arrangements because the built in type casing is itself water proof up to 33 feet and it also adds protection against sand and dust. That means this latest model is especially designed to serve users in rough weather conditions. With the old unit you can go down up to 131 feet as its water proof housing can keep it safe under water while you are shooting recreational videos. But it is not possible with Hero5 Black because it is safe only up to 33 feet. In case if you want to go for scuba diving with this unit then it is good to buy additional super suit type housing for your new camera unit but it will definitely affect your budget. Both these competing camera units use to have removable batteries so if you are planning to go for a long tour then you can take additional batteries with you. But it is important to note that batteries of both these devices are constructed uniquely so you cannot replace their batteries. Although few basic accessories of your old Hero4 Silver camera can be connected to Hero5 Black but not all of them can be utilized like this. You can check the basic specifications of both these devices to grab an idea about which parts are compatible or which are not. Both editions have built in type touch screen display that assist users in easy navigation. The new model is designed with advanced touch screen abilities that help users to control everything in much better manner and this touch sensitivity also leads to sharper details and improved contrast. It is believed to receive almost equal video clarity with both these devices as manufacturers have not upgraded the sensors for video system this time again. People were waiting so long to have a GoPro camera that can serve users with classic sensors even at low light areas but may be this feature will be added into Hero6 platform. The 4K abilities and 1080p resolution all use to provide almost equal results and even the frame rates are also equal. If you love to capture photographs then also you will have almost similar picture quality from both these cameras. The maximum supported pixel quality is 12 MP that results in 4000*3000 pixels width and height ratio. Both of these camera units can record audios that are received from external hardware. For Hero5 Black you will also need one USB-C type mic adaptor to make connection. You will be glad to know that the audio quality of latest camera is also improved by so many factors and it can help users to record the stereo audio directly. You can also have a separate audio file collection other than the original video file. The big improvement is that it has ability to generate raw audios that can be later improved by applying some post processing improvement techniques. There use to be so many situations during adventure sports activities when we are not able to hold our camera in hand. For example when we are trekking on a mountain or driving then it is essential to mount camera on a mount that can assist in all way recording. But at this time you cannot use your hands to control different camera actions thus the voice control feature will be highly advantageous for you. You simply need to shout certain commands during recording to assist your camera in basic settings and the intelligent device will keep following you. This feature provides awesome results especially when you are in a low noise condition. This latest GoPro unit use to have Wi-Fi as well as Bluetooth abilities but the most special feature of this camera is the GoPro Plus compatibility. Users can enjoy the cloud based application to store and share videos capture from GoPro Hero5 Black. You simply need to create an account on this cloud storage and then all videos can be easily transferred to cloud storage and you can keep on using your device storage so long on your tours. So finally if you are planning to upgrade your camera and have huge budget to do that then it is good to choose GoPro Hero5 Black but in case if you need something within low budget platform and demand just the basic video recording features from your device then it is better to stay tuned to the GoPro Hero4 Silver. With the higher end investment you will be able to enjoy better image stabilization, improved waterproofing and the ability to live stream via GoPro Plus application.